Preferred Office Machines is your local Authorized Xerox Sales Agent. We have been located in historic downtown Big Rapids (next to Bernie’s Donuts) since January of 1989. Xerox has a vast product line, perfect for anyone from a home-office to a large corporation. Preferred Office Machines can help you find the best fit for your needs. There are flexible purchase and lease plans available to meet every budget. Xerox Corporation provides onsite repairs and services for most of our customers, and we also have a service repair guy who fixes other models too! We also offer on-site copying, printing, laminating, scanning and faxing services. 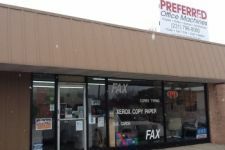 Preferred Office Machines is a member of many area Chamber of Commerce’s including; Mecosta County’s Chamber of Commerce, Reed City’s Chamber of Commerce, Fremont Area Chamber of Commerce, Ludington/Scottville Area Chamber of Commerce, Big Rapids Rotary Service Club, Ferris State University’s Presidents’ Club and the Better Business Bureau in good standing.